I think it’s impossible to really understand somebody, what they want, what they believe, and not love them the way they love themselves. I like this quote, because it is true. Aliens have attacked Earth twice and almost destroyed the human spiecies. To make sure humans win the next encouter, the world government has taken to breeding military geniuses – and then training them in the arts of war… The early training, not surprisingly, takes the form of ‘games’… Ender Wiggin is a genius among geniuses; he wins all the games… He is smart enough to know that time is running out. But is he smart enough to save the planet? 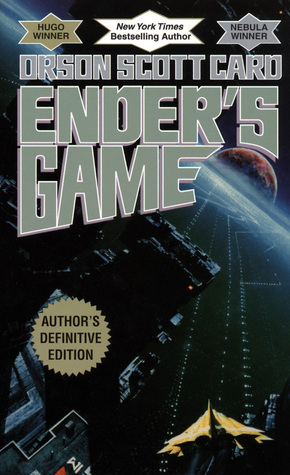 Ender’s Game by Orson Scott Card is everything I liked about Foundation by Isaac Asimov and more. It is funny, intriguing and serious. The story may take sometimes to get to the point, but I mostly like the pace it has. Ender is a well developed 6 year old and he grows with his years during the book. He sometimes feels a bit older then he actually is, but that might actually be due to the fact that he is so smart. At the time the movie was released I wanted to to go and see it. It has a star cast with Asa Butterfield, Harrison Ford, Hailee Steinfield, Viola Davis, Abigail Breslin and Ben Kingsley and all of these I enjoy seeing. But I have to be truth full and say it me forever to see it, as in last year. I really liked the movie, it was well done, most stuff from the book is in there and not too much as been added that was not written in someway in the book. This entry was posted in Book Review and tagged Book Review, Dystopia, Fantasy, Orson Scott Card, Science-Fiction. Bookmark the permalink.